This week’s photo challenge theme is “Boundaries,” exploring the creative potential of limits, borders, and dividers of all types. 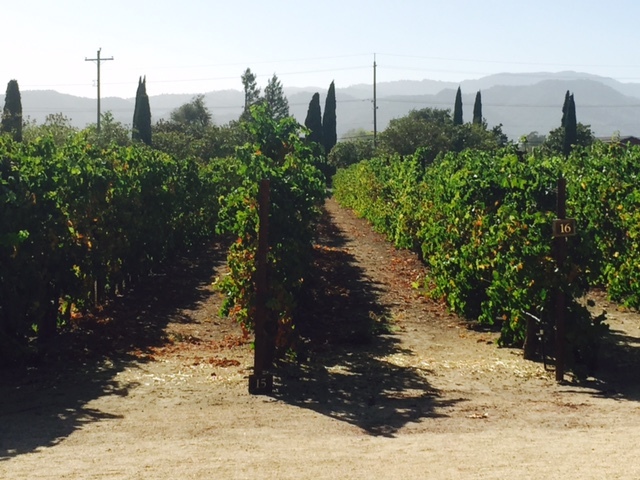 My recent trip to Napa Valley highlighted various boundaries, here, there and everywhere. There are wineries for miles. Tasted in this line, from left to right…or else you blew it. But hey, how can you not stop to visit this one? This wine comes from the grapes from that hillside over yonder. Visit the Weekly Photo Challenge site for more Boundaries. Looks good, Amy. I thought that bunny was a silver balloon at first that had made its escape! Right, it looks like it could be from a distance. It’s actually quite solid. I don’t think he’s going anywhere. 🙂 Napa has lots of public art and little structures everywhere. Thanks so much, Reinhold. It was quite tasty. 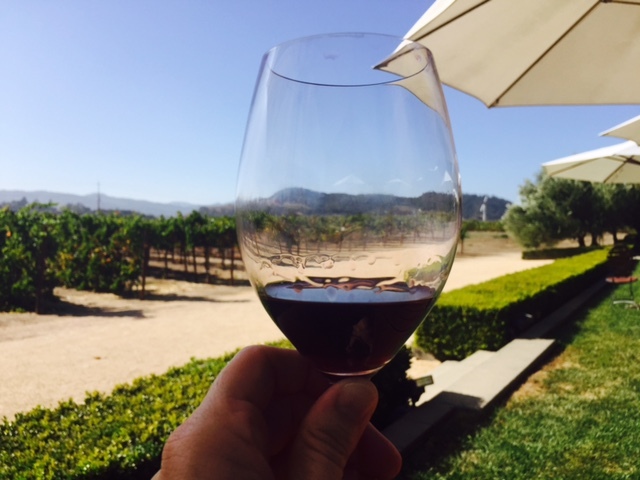 Wine tastes better in Napa. 🙂 Zum Wohle! What a nice trip that must have been! It was Carrie. Even though wine is not your preference, I bet you’d love it! It’s so pretty. I know just the place! You most definitely could. I love the photo trip, Amy. I want some! You take me there to Napa, I’ll take you to the Finger Lakes wineries. We’ll sample away and enjoy the nuances. 🙂 Yeah, that would be some fine wine tasting, my friend. Deal! Let’s do it! That sounds like fun, Mark. In the meantime, I’ll search out Finger Lakes at the Total Wine store. Maybe they’ll have it. I hope they do. 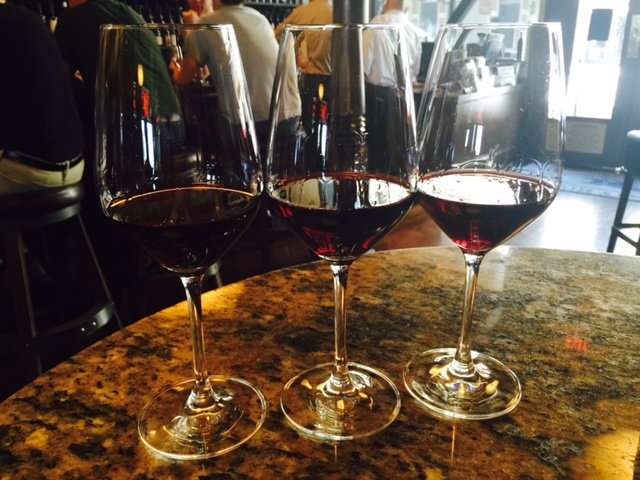 Geneva and Auburn host at least a dozen wineries, Amy. I’ll let you know, Mark! 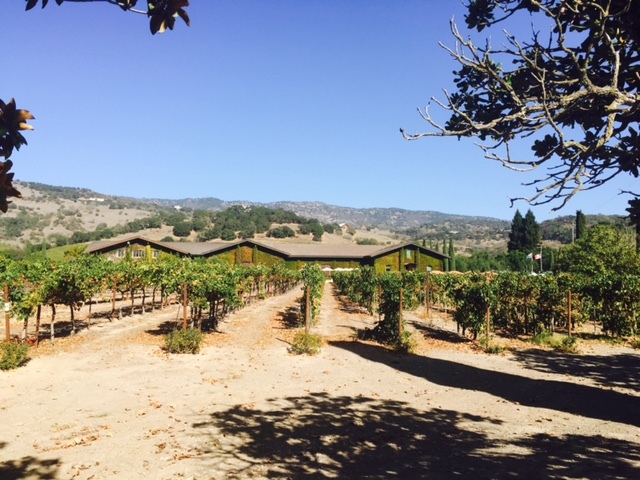 Sheryl, you can’t wrong in Napa, surrounded by all this beauty and bountiful wine. So much fun! I can see why he’s unforgettable, Jay! Enjoyed your post and your perception of everything around you. 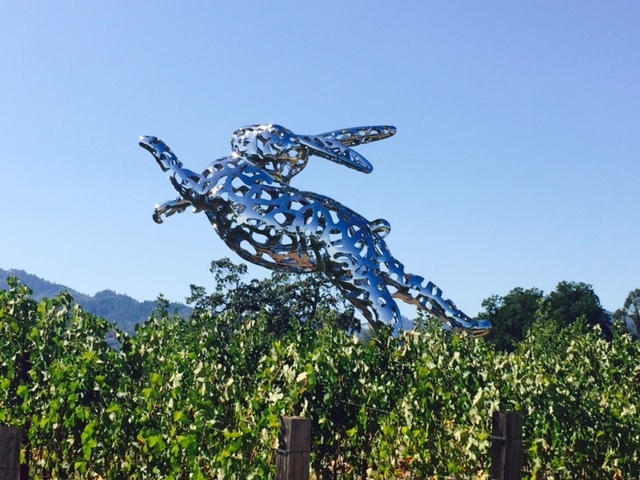 Love the bunny Sculpture. Thanks so much, Tresa. Glad you enjoyed it. That bunny is memorable! 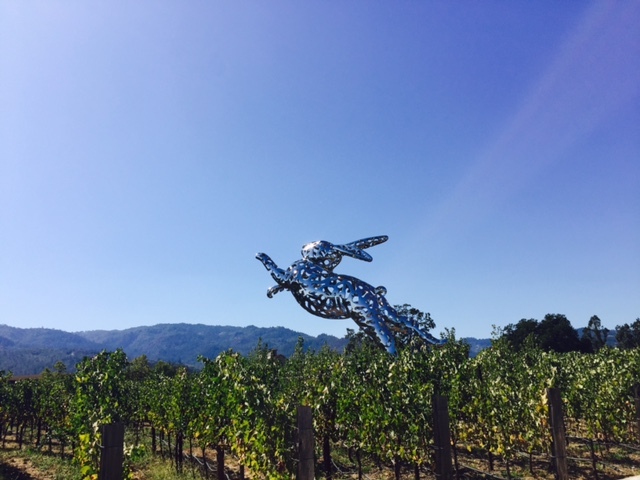 The wine looked lovely and the bunny was brilliant! The wine was lovely, Ken. I had to get a shot of that bunny! You don’t see that one every day. Certainly not! I had to double-take at the pictures!